There a few things in life that are inevitable, death, taxes, and if you’re a runner, injuries. Though I’ve had my fair share, I’ve been pretty lucky in this department and haven’t had to deal with anything too debilitating…until now. It had been a great year up until this point. My goal for 2015 was to focus on speed and technical trail running skills. To do this I opted for shorter trail races where I’d be forced to run at a faster pace to remain competitive. Last year I only ran four races. Granted they were all long and hard, together totaling 212 race miles (that’s more than eight marathons!). And while it was fun to challenge myself at these longer distances, I missed running fast. Well, you know, fast-ish. So far this year I’ve already raced four times, mostly trail half marathons. These shorter races are fun and allow for quick recovery times. They were all new courses for me (Vortex Half, Smith Rock Ascent 15M, Trail Factor Half and Mary’s Peak 50K) and it was great to be drinking a celebratory beer before noon, instead of slogging through a 50 mile day. Things were looking good for my peak race of the year, the Waldo 100K, which would serve as my qualifier for Western States. As I mentioned in my previous post, the Western States 100 is the grand daddy of ultras and it is my dream to run it some day. To get in you need to run a qualifying race to be eligible for the lottery. For every year your name is not chosen in the lottery, you are given twice as many chances the following year. Your odds improve exponentially with each entry until eventually you get in. But miss just one year of qualifying and it’s back to the beginning. There’s a limited number of qualifying races and entry into Western States is so sought after that now even the qualifying races have lotteries. It’s a crazy system, huh? I’ve qualified the last four years and after my name was chosen in the lottery for the Waldo 100K, it looked like this year I’d get a fifth qualifier, greatly improving my chances to get into the 2016 Western States. But then I had a little accident. Cycling home from a show at Mississippi Studios last Tuesday night I hit a divider on a dark street. I went over the handlebars and scraped up my right side. It didn’t seem like that big a deal at the time, so I rode home and went to bed. The next morning I couldn’t walk. Hoping it was just a strained tendon in my foot, I stopped off at Zoom Care for an X-ray just to be sure. I wanted to cry when the doctor came back with the results carrying a walking boot and a pair of crutches. He told me that I have a heel spur, a small extension of the heel bone, on my right foot. 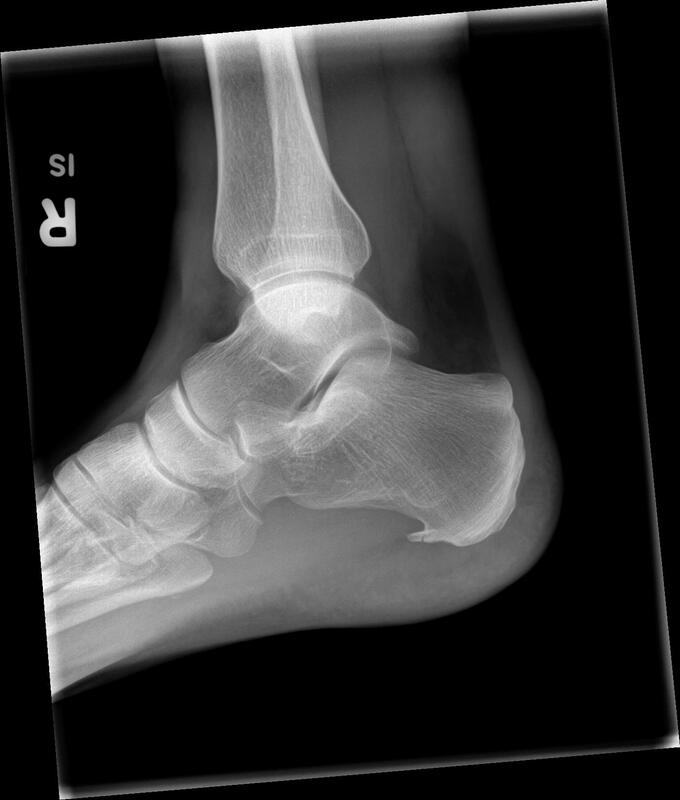 It’s not uncommon, about 10% of the population has heel spurs. 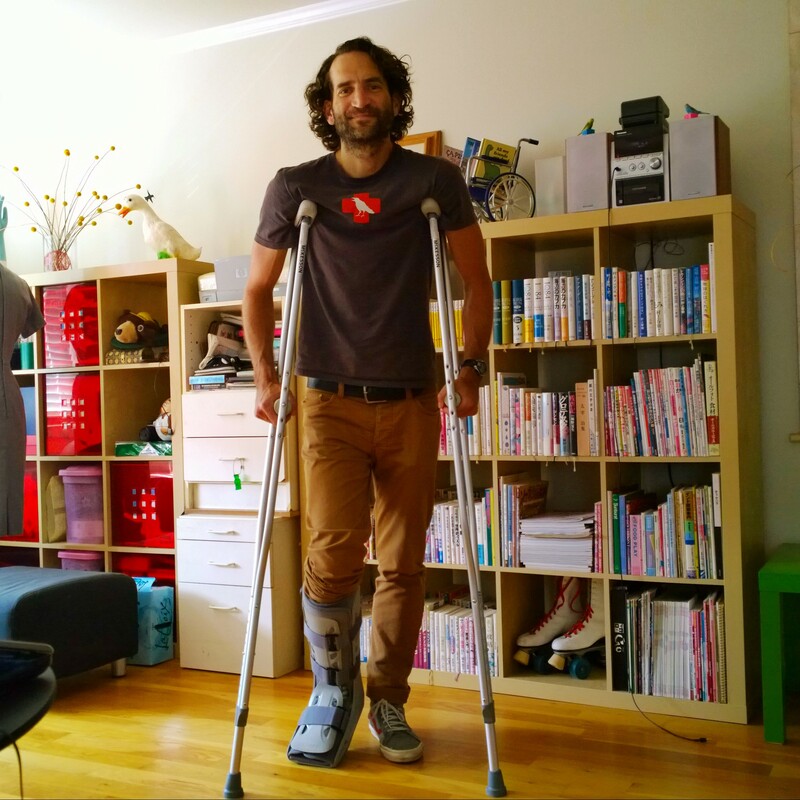 What is uncommon is to fracture a heel spur, which is what I did on the fall. It wasn’t something he’d ever seen before, so he sent me to a specialist. The podiatrist said it didn’t look that bad and would probably heal up pretty quick. I was scared to ask her whether I’d be able to race in six weeks. “Is it a marathon?” she asked. Ahhh, no. “A half marathon?” Nope. “Oh no, you’re not one of THOSE, are you?” She went on to say that ultra runners are her most difficult patients because they are so desperate to start running again that their recovery is often compromised. While it is true that I am one of THOSE, at the same time, I don’t want to be one of those who doesn’t allow the injury to properly heal. I’ve put away the running shoes until I get the green light from my doctor. I don’t know at this point whether I’ll be able to run Waldo (and qualify for Western States), but I haven’t given up hope yet. In the meantime, my doctor has given me an alternative…swimming. It’s not my favorite form of exercise, but it beats sitting on the couch reading running magazines and feeling sorry for myself.